DEAL is the largest trade show for the themepark and amusement industries.The show walks down the hall of fame each year as a 'thought leader' in the region for redefining the amusement industry. This show has shaped the region's entertainment industry and has brought together great minds and their world class innovations all under one umbrella. DEAL has led the amusement and entertainment space during this period and the testimony to this is the fact that exhibitors at DEAL 2017 have signed multi-million dollar contracts in just 3 days. If you are associated with the world of entertainment and amusement, then this is the ideal platform that you must explore. Don't just take our word for it. We urge you to take a look at our exhibitor and visitor testimonials on this website to hear from the exhibitors and trade visitors who were part of our show in 2017. Also please do take a look at our post show report section for other facts and figures. 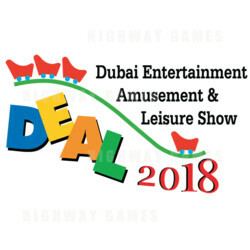 Held annually at the iconic Dubai World Trade Centre, DEAL is the region's most anticipated and leading attraction for global and local stakeholders in the amusement and entertainment industries. So if you are planning to enter the Middle East and Africa region then - DEAL is your show. DEAL, since its inception in 1995 has developed into an unparalleled platform that gathers exhibitors, buyers, and professionals from the international amusement and entertainment industry. Foraying into the 24th edition, DEAL 2018 expects to witness an even larger gathering of key players and visitors in the amusement industry from Middle East, Africa, US, Mediterranean and Asian countries. Want to grow your business? As an exhibitor, this would be an ideal opportunity to showcase your products and services to thousands of potential stakeholders who would attend the show. As a visitor, you can leverage the opportunity to tap into dedicated seminars, experience ground-breaking technology, network and grow with industry peers, and tap into profitable business relationships. Do grab this opportunity by booking your stand or registering a visit. It is very essential that you do not miss one of the world's most important converging points for manufacturers, suppliers, buyers, entrepreneurs, executives, technologists and professionals in the entertainment and amusement industry. International Expo Consults welcomes you to the 24th edition of the Dubai Entertainment Amusement and Leisure (DEAL) Show, to be held from 9th -11th April 2018 at Za’abeel Halls 1, 2 & 3 at the Dubai World Trade Centre, United Arab Emirates.